History of St. Mary's: 3. The Passionists At St. Mary's. For several years before the Parish of Harborne was founded Bishop (Dr.) Ullathorne OSB had expressed a desire to have a Passionist Community in or near the town of Birmingham. So it was that in April 1870, the Provincial of the Passionist Order came to the town with Fr. Bernardine and, in order to find a property, a Mr. Morris, who had for a short time been a Passionist Novice, was approached. He offered them a field of 12 acres across the road from St. Joseph’s Home run by the Little Sisters of the Poor in what is now known as Queens Park Road; but this was considered too far away from the Town of Birmingham and the village of Harborne. Bishop (Dr.) Ullathorne OSB was the first Bishop of Birmingham since the Restoration of the Hierarchy in England in 1850. Mr. Morris then bought and then gave them a disused Methodist Chapel with two cottages attached in Heath Street (now High Street), Harborne. This place was in a dreadful condition, full of moths and swarming with bugs. However, eventually the Passionist Fathers got the better of all the insects and were able to arrange a Solemn Opening on 26th June 1870 on the feast of The Immaculate Conception. A schoolroom was built at the rear of the Chapel and this was opened in April 1871. The Community of three Fathers and two Brothers soon found the property inconvenient and so were very soon looking for a new and larger property. In September 1873 Fr. 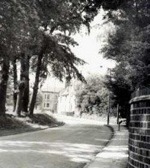 Bernardine heard of the intended sale of a house called “Harborne Lodge” with an amount of land situated in Lodge Road, later to be named ”Vivian Road”. He felt this was an ideal place for a new Church and Monastery and within two days, having been charmed by the beauty of the surroundings, had decided to purchase the property and sign the contract. Fr, Bernardine had managed to save only £100. and so Mr. Morris came again to the rescue and, forwarding £400. of the £500. deposit needed. The freehold property, together with 5 acres of land, and a good deal of furniture, was secured eventually for £4.400. “Harborne Lodge“ has been extended over the years. One month later the Community took possession of the new property and the day after that Mass was said in the Drawing Room on a temporary Altar. Weekday Masses were celebrated there whilst the Sunday Masses were celebrated in the old Chapel in Heath Road. Later, in 1874, since there was already a schoolroom in the Old Chapel House, the whole property was turned into a school and the large Conservatory at the rear of “Harborne Lodge” became a temporary Chapel. But this proved to be too small for such a growing congregation; Fr. Bernardine approached Dr. Ullathorne to inform him that he intended to build a suitable new church. His Lordship warmly approved of his intentions and gave him a handsome donation towards the cost of the building. He then set about raising extra funds from the well-to-do faithful and Passionist benefactors in England and Ireland. 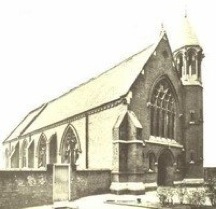 The building of a new church started in 1875 after £1,200. had been raised. The Foundation Stone was laid on 8th September, the Feast of the Nativity of the Blessed Virgin Mary. Owing to the delays in the supply of bricks and because of a very severe Winter, the building did not reach completion before early 1877. The Feast of the Solemn Commemoration of the Passion, on February 6th, was the date set for the opening of the new church. Bishop Ullathorne celebrated Pontifical High Mass and Bishop Hadley preached the Sermon. The music was provided by St. Chad’s Cathedral Choir. Amongst those present was the Earl of Gainsborough, Lady edith Noel, Mr. and Mrs Morris and family, and many other notable guests. In September 1884 the Retreat was opened (St. Mary’s Retreat) as a House of Studies and about 18 students were transfered to Harborne from St. Paul’s Retreat in Dublin, from where the pulpit, made of ebony, rosewood and satinwood, was eventually brought to St. Mary’s in 1886. In 1884 there were six Priests, two Brothers, eleven Postulants and one Lay Postulant. in 1888 there was a Census of the Parish and it was found that there were 348 catholics in Harborne, 77 in a part of Selly Oak which was then part of the Parish, 143 at St. Joseph’s Home, 16 at St. Mary’s Retreat and 17 Little Sisters of the Poor at St. Joseph’s Home, making a grand total of 601 persons in the Parish. 1890 saw the purchase of “The Shrubbery” on the corner of Vivian Road and Harborne Park Road to extend the frontage and to give more privacy to the Retreat. The next large addition to the Church was a large two-manual Organ bought for the sum of £30. in 1893. This was ‘opened’ Mr. Ashley Langston who eventually gave up his post at the Church of the Messiah in Broad Street the become the organist at St. Mary’s at a salary of £30. per annum. In May 1895 the Foundation Stone of a new school was laid by Canon McCave D.D. for two classrooms, cloakrooms and toilets in the top playground (this is where the Parish Centre now stands). Opened in November of the same year they cost £550. to build. This Foundation Stone can now be found in St. Mary’s School. Looking along Harborne Park Road towards Vivian Road (circa 1900) the “Shrubbery” can be seen in the middle distance. Photo courtesy of Harborne Library. The new school Foundation Stone. One of the most interesting features of the new church were the three Confessional Boxes down the right side aisle which were erected in September 1898 (two of which were removed to the present new church, and later removed altogether), and the beautiful stained glass windows above the main altar erected in the September of the same year. At the turn of the century the Passionist Retreat at Wareham in Dorset was closed down and it was decided that its stone Altar should be given to St. Mary’s. It was described by Bishop Ilsley as one of the most beautiful in the Diocese. At this time also the statues of The Sacred Heart, St. Joseph and St. Paul were introduced in to the Church. The new Altar, circa 1900. It had long been felt that the old house “Harborne Lodge”, now St. Mary’s Retreat, was too confined and inconvenient for a Religious Community. Accordingly, a new Retreat was planned, linking up the original house with the new church. With impressive ceremonial the new building was blessed and opened towards the end of May 1911 by the Right Reverend Dr. Ilsley, Bishop of Birmingham. During the First World war the son of the Connolly family was killed and it was in memory of him, and other men in the Parish, that the Connolly family gave the Calvary Group as a War memorial. Only the Crucifix of that group remaind today and can be found to the right of the rear entrance to the new church with the two War Memorials either side. 1923 witnessed the revival of the Forty Hours Devotion, the last one had taken place at St. Mary’s some ten years before but now was enforced by Canon Law. After many fund-raising events the church debt was finally paid off in 1932 and the Consecration of the Church was at last allowed to take place on 13th April. A three-hour service which began at 8.45am was celebrated by Archbishop Williams, assisted by Bishop Dr. Griffin, later to become Cardinal Griffin. 1932: The Church Consecration Committee. It was during this year, 1932, that another Society was added to the parish with the inauguration of a branch of the Society of St. Vincent de Paul and a Mr. Forsyth was appointed as its first President. In 1936 two Infant Classrooms, cloakrooms and Lower Playground was added to the school. These two classrooms still stand today but the playground is now the Priory Car Park! The Centenary Celebrations commemorating the coming of Blessed Dominic Barberi CP. to England took place in 1940 with great ceremony. Dr. Griffin (now Bishop) sang Pontifical High Mass assisted by the Clergy from the Oratory and other churches. The church was decorated with many pots of chrysanthemums grown in the Conservatory by Fr. Lawrence. Many older parishioners will remember how narrowly the church escaped from being burnt down in 1961 when, on one Summer afternoon, a fire started in the Candle Room. (This small room was just off the Sacristy - now the Conference Room) Before it was eventually put out the Sacristy was completely blackened, the paint blistered, windows were broken and walls throughout the Lady Chapel were all charred by smoke. If the fire has started by night no doubt it would have spread to the rest of the church and the Retreat. It was at this time that the rest of the stained glass windows were put into the Church and the old pipe organ, which was past its prime, was replaced by an electric organ. St. Mary’s in 1964. Photo ©Don Wright, courtesy of Harborne Library. The Passionists celebrated the centenary of their arrival in Harborne. It was a great social occasion, with many past members, friends and visiting priests. The chief festival was was an open air Concelebrated Mass at which Archbishop Dwyer was the Chief Celebrant. Tea was provided afterwards in the gardens. After 100 years it was decided to modernise the Church. The Altar and Communion Rails were removed. The Organ and Choir were removed from the Organ Loft, and the Lady Chapel was transfered to the Side Chapel, which was the Sacred Heart Basilica and now the Sacristy. Fr. Casimer, Fr. Benedict, Fr. Bernard, Fr. Sylvester, Fr. Vincent. St. Mary’s Church 1970. The brick wall with the door in the middle was the entrance to the Upper Playground and the two Classrooms. The Parish Centre now stands on this site. And so it can be seen that St. Mary’s Parish has progressed with the times. Many Parishioners have been sad, and perhaps a little nostalgic, to see so many of the things to which they have become accustomed change within the Parish and the church. And so it was when it was announced that the time had come for the Passionist Fathers to move on - for the congregation had come, over those one hundred years, to have great regard and love for their “Founding Fathers” and for all the work they had put into the Parish and for all they had achieved. The Passionists finally left Harborne in 1973 when the Augustinians took over the Parish. For the continuing story please click the link to the next page below. 1911: The new extension joining the Church to the Retreat. St. Mary’s Church, opened on 6th February 1877.